Saturday, May 23, 4:30-7:30, overcast, 70, 12 pound tippet. 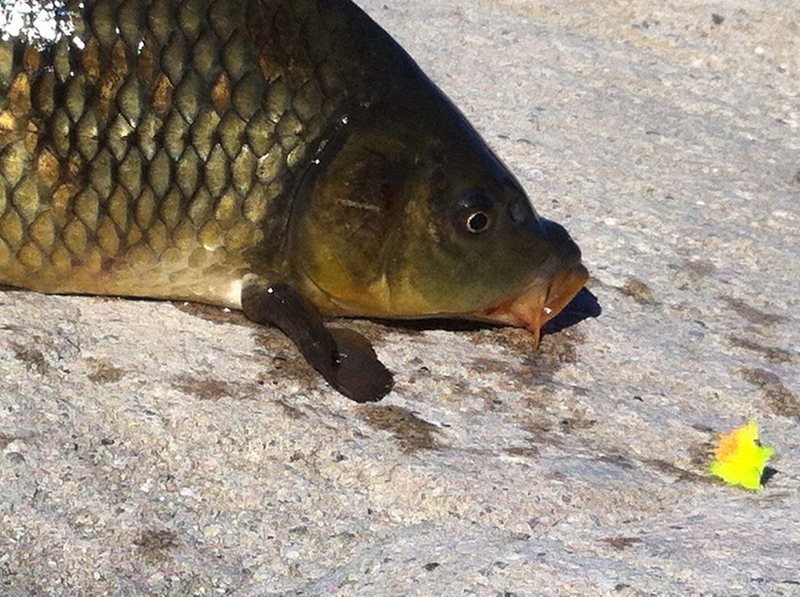 One carp charged and then turned away from a swimming nymph, rust brown dubbing with lighter rabbit tail (size 8). Tuesday, May 26, 2:30-5:30, overcast, 70, 2X tippet. After rejections on bead head black wooly worm with red yarn tail and bead head swimming nymph with crazy orange dubbing and lighter rabbit tail. (size 8) hooked up on a carp dragon (Orvis). Carp eventually got free because I didn’t set hook deep enough. Saw about 50 pass me in the water, few feeding. Saw the white one again. Thursday, May 28, 2:30-5:15, clear, 81, 3X tippet. Fish swam up to all of my flies, except the squirmy wormy. That means tortilla fly on red hook, terminator glo bug in chartreuse and orange, all got mighty big looks, but ultimate rejections. Saw the white boy several times, and there were lots and lots of carp. Also, again, “muddling” by one really aggressive fish, but it’s hard to see which way the fish goes through the mud. Also, chummed with two cans of corn to pretty negligible results. The tortilla fly is a dead ringer for canned corn. Didn’t make any difference. Commenter Steve recently asked me: I’ve been down to the river several times and seen some beautiful and fishy waters, I have had no luck whatsoever hooking up with carp there. Any tips? Should I be sight fishing only, or should I toss my glo-bug in riffles, etc, “trout-like” spots? Are you moving around a lot or focusing on a particular spot for a while? Great questions. Hope that my response will lead to more catches for more fisherman. 2. Your best bet is to spend some time in a section and, yes, look for fish. 3. Once you’ve found them, check out their behavior. 4. If they’re swimming quickly upstream, they won’t feed. 5. If they’re circling quickly, ditto. 6.If they are jumping out of the water, forgetaboutit. What you want are fish close to the bottom (you’ll be able to see them) that are actively feeding. If you see bursts of mud coming up from the bottom, they’re feeding. 7. Target a single fish. Throw your Glo-Bug (chartreuse is good) upstream about six feet. The fish are also super-spooky. If the egg passes above their heads, add a bit of weight. You have to basically float it past a two-to-three foot feeding cone. Don’t let the line touch their head or sides. Immediate spook results. Well put. Knowning carp behavoir is all important and saves time (not casting to probably non feeding fish). Time on the water sure helps. Good luck commenter! The LA river carp are so interesting. Someday!